This is our first year for growing garlic and now we are slapping ourselves for not trying it years ago because it was so easy. We planted the garlic cloves back in October and then just let them do their thing, no difficult maintenance required. They sprouted before winter set in, then the real growth came in spring when the temperatures warmed up. 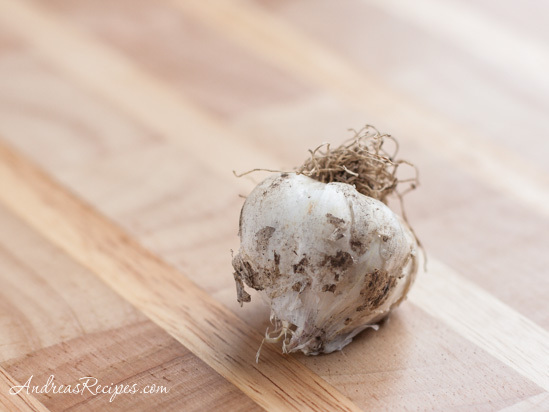 We planted softneck silverskin garlic, the most common type of garlic you’ll find in markets or stores. It doesn’t have scapes like hardneck garlic, but it keeps longer after harvest than the hardneck type. Softneck garlic is good for braiding, something I really should practice but I’m all thumbs when it comes to fine motor skills. As always, we learned a few things with our experiment. 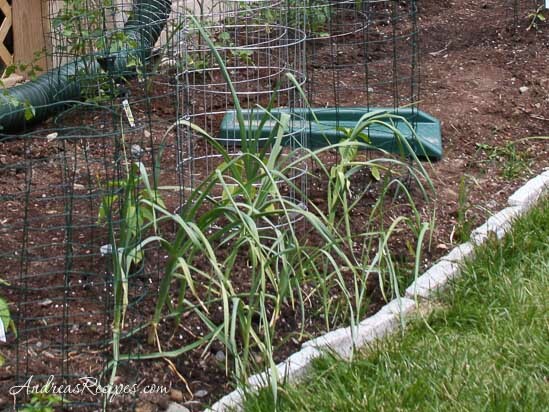 First, choose a type of garlic that will thrive in your area. In general, hardneck varieties do well in cold climates and softneck varieties do well in hot climates. Plant only the biggest cloves because they yield the biggest bulbs with the most cloves, and save the little cloves for the kitchen. Plant cloves in October to November in a sunny spot about two to three inches (five to eight centimeters) below the surface. Keep it watered in the spring and when the weather turns hot. Once the green tops start to brown and lay over, stop watering for at least one week before harvesting. Harvesting is not difficult, just carefully dig around the bulb without touching it to loosen the roots then lift it out. 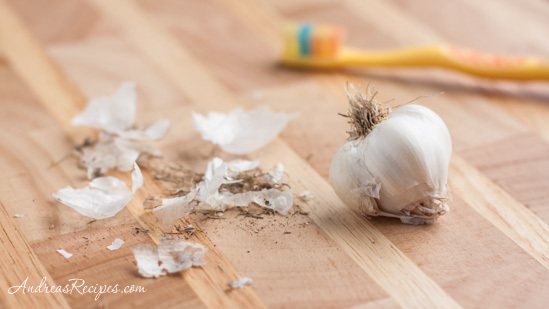 Tap the garlic a little to get most of the dirt off, but don’t worry about removing all the dirt because you want to leave the papery skin on for storage. If you harvest on a dry day you’ll have an easier time tapping off the dirt. 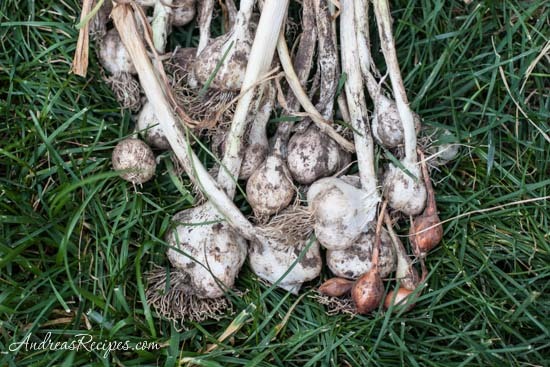 You can use the newly harvested garlic right away, but for long-term storage it needs to cure (dry), so put it in a place out of direct sunlight (not the refrigerator) for about two weeks. We hung it from the rafters in our basement root cellar. After the garlic has cured, you can braid it. Softneck varieties will keep for up to eight months and hardneck varieties will keep for up to two months. And of course, save some of the big cloves for planting again. When ready to use, just cut away any dangling roots and use a clean dry toothbrush to gently rub away the outer skin and remaining dirt. Roasted garlic is one of my favorite foods. It tastes delicious smeared on good artisan bread and adds another dimension of flavor to tomato sauce, mashed potatoes, caramelized onions, hummus, and many other dishes. Serve the hummus with raw vegetables, pita slices or pita chips, or baguette slices. It’s also delicious on bagel or pita sandwiches with avocado slices and alfalfa sprouts. This is my contribution to Grow Your Own, a blogging event that celebrates the dishes we create from foods we’ve grown, raised, foraged, or hunted ourselves. Amy of Playing House is our host for this round, so be sure to visit her blog for more information about submitting your post. The deadline is July 30. If you are new to the event, you can read more about the rules for participating at the Grow Your Own page. Squeeze the roasted garlic cloves out of the skin. In the bowl of the food processor, add the beans, tahini, lemon juice, sea salt, and garlic. Process for a few seconds to get the mixture started. While the processor runs, begin drizzling in the olive oil, starting with 2 tablespoons, adding more as necessary to create a smooth consistency. 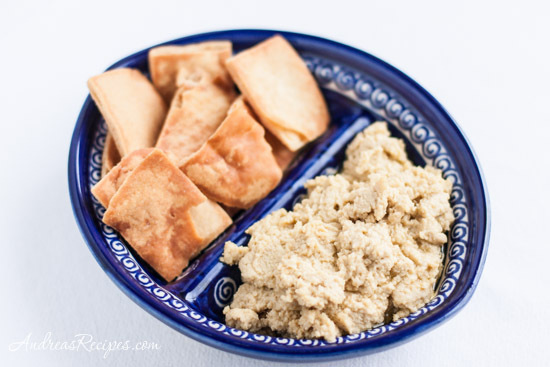 We love hummus in our house, and I have never tried making it with roasted garlic. Now I will; what a super idea. Your site is looking absolutely great! Oh, yummy! That hummus must be very fragrant! So cool that you grow your own garlic! The recipe looks delish, I will try it soon. Thanks for all the info on growing garlic. A terrific post. I’ve got some in the ground, but didn’t really know what I was doing. This will help. (Yes, I did change my blog name). Excellent post Andrea. I will try this out for next year. Great tips and I love your Polish pottery! I have never put so much garlic in one hummus but actually why not since I love the smell and taste of roasted garlic. 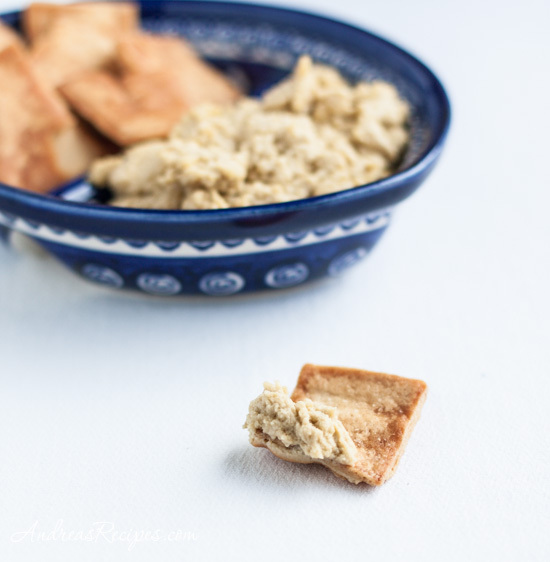 A roasted garlic hummus is quite delicious. When I do dinner parties I tend to include some sort of hummus as an appetizer before dinner. This will be my next hummus choice. Thanks for sharing this. I don’t think I have space to grow my own garlic, but I definitely make my own hummus and this looks like a great one.